The apartment is on the ground floor with direct access from the garden and the outdoor space and equipped with garden furniture and barbecue, parasol. The bathroom has a shower and washing machine. The living area is spacious with a dining table, six chairs, a sofa and a sofa bed and a large French door. We are in a very quiet area of ​​Stresa just a few minutes walk from the pier, municipal swimming pool, beach, restaurants, bars and the beautiful promenade leading to the center of Stresa 800 meters away. Parking is outside the house, but always usable. The chalet is close to starting points for trekking itineraries that lead to the hills of the lake through chestnut and birch woods, mountain pastures, residential villas and botanical gardens. The routes are all provided with signs of the tourist office. of Stresa. The cable car that leads to Apino-Mottarone is 200 meters from the house. Very nice and big enough that our 20month old could run around happily! Perfect for 3 days, short visit with a 20month old. We recently stayed at this property and had a wonderful experience. The location is in a residential setting near Lake Maggiore and a 15 minute walk to the downtown quarters. The accommodation is spacious, very clean and well maintained. The kitchen is well equipped and we were able to take advantage of the local grocery store, Gloria's, and cooked some wonderful meals and enjoyed them on the beautiful patio right outside the french doors to the suite. Most importantly our host Manuela was so lovely and helpful in making sure we were comfortable and knew about the local attractions and things to do. Her garden is quite spectacular with beautiful stone statues displayed throughout. Wir hatten eine schöne Woche in der Villa Lucciola! Nach der kurzen Führung durch die sehr nette ältere Vermieterin, die übrigens sehr gut Englisch spricht, fühlten wir uns direkt sehr wohl. Obst im Kühlschrank, Kaffeekapseln für die Lavazza-Maschine, Milch und Cornflakes sind nur eine Auswahl dessen, was uns bereits bei Ankunft erwartete. Lediglich die in unmittelbarer Nähe vorbeifahrenden Züge störten die Idylle ein wenig, weswegen wir keine 5 Sterne vergeben können. Der Fußweg zum Zentrum von Stresa über die Promenade dauert ca. 20 Minuten, lohnt sich aber unbedingt, wenn man im Ort keinen Parplatz benötigt. Alles in Allem eine empfehlenswerte Unterkunft für einen angemessenen Preis. Die Wohnung ist sehr gut eingerichtet und sehr sauber. 2 unterschiedliche Kaffeemaschinen ( Kapselmaschine und Filtermaschine ) , genügend Handtücher sind vorhanden . Wir waren sehr zufrieden . Die 3 Hunde der Vermieterin empfanden wir als nicht störend, sie waren ganz witzig.Der Essplatz im Garten War u sehr bevorzugter Aufenthaltsbereich. Alles in allem ein sehr angenehmer Urlaub. Thank you so much for your kind review. It has been a pleasure to meet your nice family. Apartment in villa with private garden and equipped, located in a quiet residential area of ​​Stresa and the greenery of villas and parks. The beach and the communal pool. are 200 meters from the house. The dock and the cable car to Mottarone and promenade of Stresa are 200 meters. Excellent starting point for hiking or cycling, and you get to the city center 800 meters away along the beautiful promenade of Stresa with its excellent restaurants and ice cream parlors. 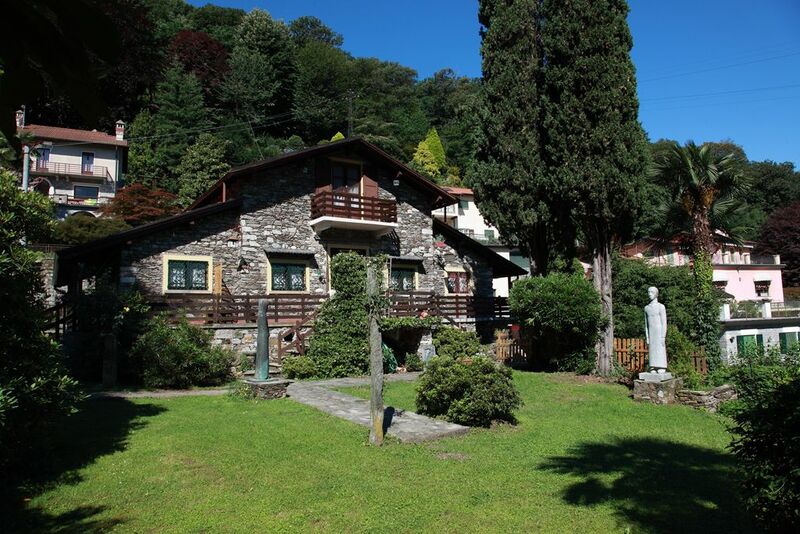 For lovers of trekking and hiking there are extraordinary tours to the hills of Stresa in the woods of chestnut and birch trees and alpine pastures and the starting point of these trails it is next to our chalet. : .Nel periodo invernale c'è un costo aggiuntivo per il rscaldamento. La biancheria da letto e da bagno, la pulizia finale sono inclusi nel prezzo.